Home » Blogs » 7GenGames » We Loved USDA Even Before They Featured Us in Ed-Facts! 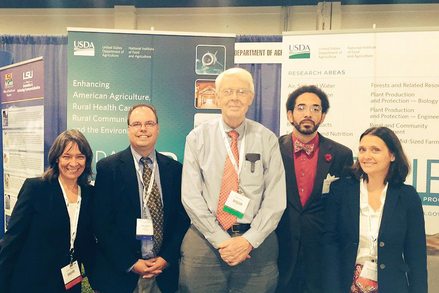 Our co-founders, AnnMaria and Maria, with the fine folks from USDA. As you may know, the U.S. Department of Agriculture (USDA) has been instrumental in 7 Generation Games growth. In fact, it’s not really an overstatement to say that you likely wouldn’t be here at all if it weren’t for USDA. We’ve received three grants from USDA to date for Small Business Innovation and Research, allowing us to build our games. “Wait, USDA and video games?” you might be asking yourself. But what people might not realize is that USDA isn’t just about crops. The department is committed not just to agriculture, but agricultural communities. In other words, for USDA, it’s not just about the product, but also the people. As such, they offer grants for companies working on rural and economic development issues. And you can’t get much more rural than many of the schools we’re working with in North Dakota. And it doesn’t stop there. We were invited to participate in the Ed Games Expo, organized by the Department of Education, in D.C. in early December – where will be demoing our game as an example of the cool work USDA is backing when it comes to educational video games.